Healthy Summer Glow All Year Round! Since summer is officially over, fall is here and winter is just around the corner I thought I would share some of my best tips on having a healthy summer glow all year! Firstly everyone needs a good tan glow everyday of the year and my personal favorite is Cocoa Brown by Melissa Carter 1 Hour Tan Mouse. First I exfoliate with the Cocoa Brown Tough Stuff exfoliator apply the 1 Hour Tan with the Applicator Mit and an hour later shower the excess product off. If your looking for something dark you can leave it on longer or apply it for a few days in a row but for me to get a natural glow I do it for the hour, wash it off and it gives me the perfect amount of color. Another thing I’ve found to keep me in the summer mood and keep that glow going is to keep my favorite summer foods in my diet. I love pineapple and watermelon so I keep buying those until they are completely out of season. Of course I keep eating ice cream specifically Ben & Jerry’s Chocolate Chip Cookie Dough, another thing I love for dessert during summer is frozen grapes so I keep eating those too! If you would like some more inspiration with some recipes and healthy foods, I recently was checking out ALOHA and saw that they have TONS of healthy recipes to make and enjoy so be sure to check them out! And last but not least BRONZER! 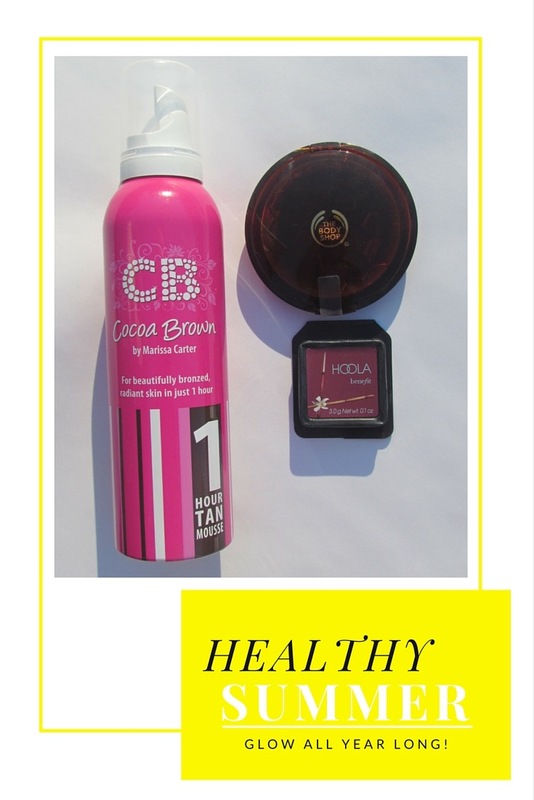 My current favorites are Benefit Hoola Matte Bronzer and The Body Shop’s Honey Bronze Bronzing Powder. Because if your too lazy to self tan or continue eating like its summer, bronzer will never let you down. If your feeling fancy you can try a subtle contour or just use bronzer like you use blush with just a simple sweep on your cheeks. And that my friends is how I keep my summer glow and summer feeling going all year round. How do you keep your summer glow going all year long? PS! Im doing an Instagram giveaway right now which ends November 2nd! So hop on over to my Instagram to find out more information & good luck!